Bradley Kleihege had himself a heck of an entertaining run on Survivor: Ghost Island. After the first tribe swap, there was a time in which it felt like he and his alliance of five was going to be running the entire game. Yet, tribe swaps have played a huge role this season in reshuffling the game and they certainly did that here. He found himself in a surprising spot on the third iteration of Naviti where some of his former allies, in particular Domenick, were willing to turn. So what does Bradley think about the blindside vote now, and is there anything about his attitude around camp that he wishes he had changed? Take a look at our exit interview for more discussion on that. CarterMatt – Was it hard sitting back and watching yourself be voted off? Bradley – Going into the season there was a big part of me that was like ‘this is not going to be fun to watch,’ but I have to say that I have thoroughly enjoyed every second of it. I look completely ridiculous and it’s really fun to watch. Last night was no different; I was lucky to watch the episode with Michael and Stephanie Johnson and it was a lot of fun. It was like watching any other episode of Survivor, but it just sucked a little bit at the end. Were your antics around camp the real reason you went home, or was it something deeper than that? It was definitely something deeper. [Domenick] thought I was a threat because I had such control at the Malolo camp when I was there and I was really close with Kellyn. Dom didn’t trust the two of us. What you see and what it looks like is that they got rid of me because I was annoying. What I say about that, beyond the fact that he’s told me that’s not the reason I went home, but Dom is a really good Survivor player. He knows enough that if he thought I was annoying everyone, he would take me to the end because I’m an easy person to sit next to. I was tight with him, but he got rid of me because he couldn’t trust me. Possibly, I think he may have made the move a little too soon, but I don’t think that he made the wrong move. Eventually, I would have gotten rid of him. I definitely think the motivation for Libby and Donathan, beyond ‘anyone but me,’ was that I was annoying to them. But, from Dom’s point of view, it was something much deeper and he was definitely the driving force behind my blindside. Was the perception accurate that you and Kellyn were leading the Malolo tribe after the swap, and how aware was everyone of that? Kellyn and I were 50-50 running that beach. We were super-tight out there. What we would do is sit down and figure out what we wanted our alliance to do. Then, we would meet with them individually and then as a group. We would wait for them to suggest what they wanted the plan to be and then we would encourage it. We never threw out a name and we would never make them feel like we were [controlling things]; instead, they would throw out ten different scenarios and we would shoot down the ones that weren’t the scenario we already decided. We would just encourage the one that was. Nobody felt like they were on the bottom because they thought they were making the decision. In reality, Kellyn and I were just covertly doing the thing that we wanted to do. This is something that you kind of mentioned in saying that it may have been the right move for Domenick to get rid of you — would you have actually gone far after the merge with him? Would you have just targeted all the original Malolo people after the merge? I don’t know. 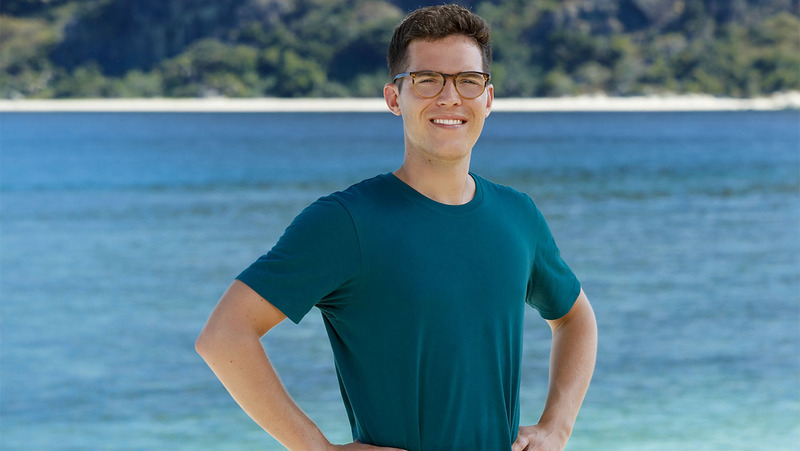 Here’s the deal — out of the original Malolo people left, Michael is the only one who is playing the game. The way I perceived Donathan was that he wasn’t going to win and Michael was the only one who I thought could win. Kellyn and Michael and I were really tight, so going into the merge I would have had Kellyn, Michael, Jenna, Sebastian and Des; then, Kellyn had Chelsea and Sebastian and I had Wendell. I think we would’ve been in a great position. I don’t think we would have gotten rid of Dom immediately, but I think it would have been pretty quick. So where did you stand on what was the cold war in the game between Chris and Domenick? Oh, Domenick. Chris was obnoxious. Outside the game Chris is really fun when everyone has had food and drinks, but on the island Chris just doesn’t have an off button. You can go hang out with the guy for a couple of hours and it’s really fun, but then you leave. On the island you’re stuck with him almost 24 hours a day. I was definitely on Dom’s side. I’ll give you and Kellyn a lot of credit for being able to control that group of five on the Malolo camp. Did you actually think that you, Kellyn, Chelsea, Sebastian, and Des could’ve been the final five? No. I guess it could’ve been, mostly because I don’t think any of those three would’ve beat Kellyn and I. Kellyn would’ve beaten me, but I think that if we had gone to the five and I had gotten rid of Kellyn before the final four, I think I would have won. I love Des, but she was not a strategic mastermind. Chelsea was pretty much irrelevant. Sebastian is awesome, I love the guy, but he’s not a strategic mastermind. It was more an alliance of necessity. When we were on Malolo we just assumed that it was Naviti Strong and we didn’t know what happened to Morgan at that point. We had thought she had been idoled out and didn’t know that there had been some flipping. We just assumed that an idol had been played, and our assumption was that everyone was going to stick together. With this season being Ghost Island, are you bummed that you didn’t get a chance to be a part of it? Yeah, absolutely. I would’ve loved to go to Ghost Island. It was a big question mark — I’d been looking forward to seeing it on TV just because for the past year it had just been this big question. It’s still such a bummer that I didn’t get to go in real life. I would’ve loved to have seen all the torch snuffers and be able to play for an advantage. That’s the biggest thing as such a fan — I looked for idols constantly and I wanted to find one and to get to play one. At Malolo I was playing the game with the hand that I was dealt — my best move was to vote out all of the Malolos. That doesn’t make it exciting TV, but of course as a fan I wanted to make big moves and find idols. You seemed to relish being in that sort of villainous role out there; you were snarky and in some ways similar to a Tyson kind of character. Was that something you expected for yourself going into the game? That was 100% what I set out to do. I wanted to be a Survivor villain. I wanted to be like a Tyson, snarky and a little villainous. I never wanted to come across as malicious and I never wanted to bully anybody. I’m not that kind of villain; kind of a lighthearted one. That’s exactly what I wanted to do; I’ve been watching this show since I was nine and I’ve loved the villains, like the Villains tribe on Heroes vs. Villains. I loved watching Courtney Yates, Tyson and Sandra and all of them. I loved my edit, I loved getting to watch myself in that capacity on the show, and I thought it was really fun. I went in with the mindset of ‘I want to make this the most entertaining season possible’ and I think that’s what I accomplished. I think I did my part. Have you found that the people who interacted with you on social media have gotten that, or do you almost embrace the social-media hate that comes your way as a villain? I would say that the death-threat tweets get a little old and I don’t respond to those, but I search ‘Bradley Survivor‘ on Twitter and there are all these people who are like ‘oh my gosh, I want this person off my TV’ or ‘he’s the worst person I’ve ever seen in my life.’ That will definitely get a like from me. I just think it’s hilarious! It’s exactly what I wanted — I wanted people to have a reaction. One thing I will say is that I’ve been completely shocked about the amount of hate to the amount of love. The amount of love has been way more than I ever would have guessed. It’s probably two-thirds people who love me on the show to a third who can’t stand me. I never guessed it would be like that (laughs). I thought I’d be universally reviled as a character. I love that people have the same mindset of me as a fan — I would much rather watch someone like me on the show than someone who is just fake and boring the whole time. Was there a part of it that was more challenging than what you expected? This is probably not going to be a popular opinion, but the survival aspect of Survivor was way easier than I thought it was going to be. What people don’t know is that before that immunity challenge last night it poured rain for a few hours — that was the only time it rained! Otherwise it was dry, it was nice, and we didn’t have [any problems]. I lost 18 pounds in 19 days. We really were starving, but what was shocking was that I was never hungry. All I could think about was food but it wasn’t like in your normal life where you’re having lunch in half an hour and your stomach starts growling and you think that you’re going to die. It just wasn’t a big deal! I would’ve loved to eat more, but I managed it. As a Survivor fan that was the most surprising aspect — the survival part wasn’t as bad as I thought it would be. Going into the game I had my expectations as to what Survivor would be like and it was ten times cooler than I ever thought it would be. Jeff [Probst] is cooler than you could ever imagine and he’s exactly what you want him to be out there. He’s awesome and he loves to banter back and forth with you. The producers are awesome and the production is really impressive. All of it was such a surprise. I would’ve loved to make the merge and it was really hard to go to Australia [on the pre-jury trip] with people I had voted out. But, I was able to mend those relationships and I’m probably closer with them than anyone else on the cast. It was really, really awesome. I’m assuming that you’re going to want to come back; do you think being a strategic player who was voted out early, kind of like Tyson was in the past, almost helps you since you’ll be underestimated? I think if I go back — or let’s say, when I go back because I want to deposit that into the world — I think my edit will help me. I think it comes across to a lot of people that I was outrageous and had no chance of winning, and I think that will help me more than going pre-merge. Nowadays, look at people like Stephanie or Ali last season. [Going home pre-merge] doesn’t mean the same thing that it used to in previous eras of Survivor. People’s mindsets have changed. The idea you can vote out a big threat before the merge is a relatively new concept, at least as a consistent concept. I don’t think as big of a deal as it used to be.